You’ve Reached a Decision Maker. What next? 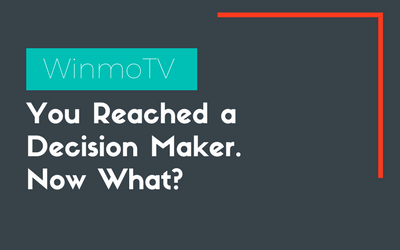 You've Reached a Decision Maker. What next? In sales, everyone’s goal is to reach a decision maker to pitch to. So why are so many sales people so badly under-prepared when their calls are answered instead of sent to voicemail? Dave Thomson offers three simple tips to make sure you’re locked and loaded when you actually find yourself talking to a decision maker. If you need to generate a list of decision maker prospects fast, Winmo’s filters can help you find the right person, in the right organization who has budget to spend. Grab a free trial here! Hey, it’s Dave Thomson over at List Partners and today I want to talk specifically about decision makers. So today I want to talk about specifically when you’re reaching out to decision makers, how to be prepared, how to talk to decision makers, and thirdly, how to set an appointment with the decision maker much, much more quickly than you’re currently doing. First of all: be prepared. What I see a lot of times is sales reps are very prepared to make a phone call and leave a message, but they’re not prepared when that decision maker actually picks up the the phone. One more thing where I see the sales cycle really increase with a lot of sales reps is the back and forth trying to set up a conversation or time to chat. So what I recommend is anytime you get a voice message, or an email backfrom the decision maker, have some typeof technology were you can immediately shareyour calendar with them, and allthey have to do is really click on themouse twice to set up an appointment with you as opposed to the back andforth trying to figure out a good time or date to meet that could take, you know,days if not weeks to finally set up. To really shorten that sales cycle, have something in place where you can show that decision maker the visibility into your calendar and they can quickly set up a meeting for you guys to chat in the near future. Final thing, when you’re speaking and having a conversation, finally, with a decision-maker, make sure it stays really high level and don’t get into the nitty-gritty, don’t get into the weeds in terms of specifics. Keep it high level in terms of what your company can save them in dollars or time.That’s going to be the most specific to that individual. When you’re when you’re talking with people underneath that decision maker in the tactical approach, and tactical things that you bring to the table,but in terms of these decision makers, a lot of times they just want to know what are you going to save them from monetary standpoint and from a time standpoint. Keep it at that level. #1 be prepared with the script when calling a decision maker. #3 when going back and forth via email, you want to immediately send that decision maker a calendar invite with your availability so that individual can quickly click on and schedule a meeting with you without all the back-and-forth. Please leave a comment below you can hit me up directly via email or hit me up on LinkedIn.